New ESPN College Football Roles for Griese, Levy, Ponder and Tessitore in 2016 - ESPN Press Room U.S.
Four prominent ESPN commentators will have new college football roles for the upcoming 2016 season, it was announced by Mark Gross, ESPN, senior vice president, production & remote events. Samantha Ponder joins the ABC Saturday Night Football telecast as a reporter, while play-by-play commentator Joe Tessitore moves to the ESPN College Football Primetime game. Additionally, Steve Levy who returns to a weekly college football play-by-play role, forms a team with Brian Griese to call action on ABC or ESPN on Saturday afternoons. Ponder will continue her role as a contributor for the Emmy-award winning College GameDay Built by The Home Depot and College Football Live, and then join the returning ABC booth of play-by-play commentator Chris Fowler and analyst Kirk Herbstreit. Ponder, who started at ESPN in 2011, has worked as a reporter in the past for college football (Thursdays) and college basketball, as well as Longhorn Network events. 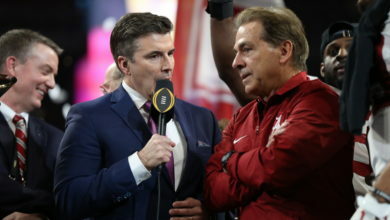 Tessitore will make the transition to ESPN’s Saturday primetime game after serving as play-by-play caller for Thursday night action last season and as host of SEC Nation on SEC Network. He will work alongside returning analyst Todd Blackledge and returning reporter Holly Rowe. Tessitore joined ESPN in 2002, and has worked various roles on the network’s college football, basketball, boxing and horse racing coverage. Levy, who joined ESPN in 1993 and will continue his SportsCenter hosting duties, will work an afternoon window on ABC or ESPN with Griese and field analyst Todd McShay. Levy called hockey games for many years including the Stanley Cup Finals and NCAA Frozen Four, and had previously served as an ESPN college football play-by-play commentator for four seasons (1999-2002), as well as calling a handful of regular-season and bowl games over the years. Additional college football announcing roles and teams will be revealed in the coming weeks.